Rituals for Spatial Transformation (2012-2014), Video still by Oren Goldenberg. Between 2013 and 2014 in Detroit, the four high rise towers that were the last remnants of the Brewster-Douglass housing projects, the country’s first federally-funded public housing for African-Americans, were demolished. While the towers had been officially cleared of residents in 2008, they were, in fact, still home to a handful of people up to the time of their demolition, as Oren Goldenberg’s 2012 cinéma vérité short Brewster Douglass, You’re My Brother reveals. 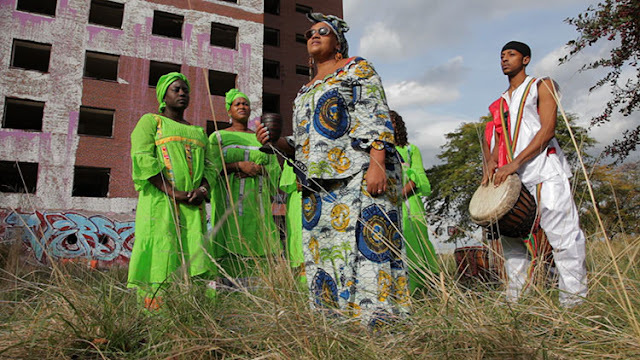 The video opens with a two-minute montage depicting the derelict complex from a series of neighboring perspectives—evoking its omnipresence, both physical and psychic, in the Detroit landscape—set to the sound of a gospel crooner’s insistent refrain that, “Time don’t wait for no one.” Then the focus shifts to Darlene, a long-term resident who says, as she reflects candidly on her hard life, that she survives by scrapping, and that she hasn’t seen her large family in years. At the end of the video, with the towers’ demolition imminent, Darlene is seen leaving, her empty hands in her pockets. She’s crossing the I-375 overpass, going—where? She doesn’t say. Does she know? Goldenberg’s empathetic portrait of Darlene is typical of the video and installation artist’s concern for what happens to people when the spaces around them change, and for what happens to Detroiters, in particular, when their public institutions collapse.